After much deliberation the final results are now in. Out of the six, 2018 North American Camp BizSmart Competitions, the Grand Champion Team for 2018 is: Savioke Team Driven, with their product innovation, NeverWait. These aspiring young entrepreneurs attended the Camp BizSmart entrepreneur academy at Santa Clara University in Santa Clara, CA. Pictured above is the team presenting at the Camp BizSmart Competition on July 19th at Microsoft in Silicon Valley. Judges for this competition were: Bill Joos, Paul Witkay, Ed Lambert, and Mythili Sankaran. A special thank you to Savioke CEO, Steve Cousins for inspiring our Camp BizSmart students to look into the future of robot technology. 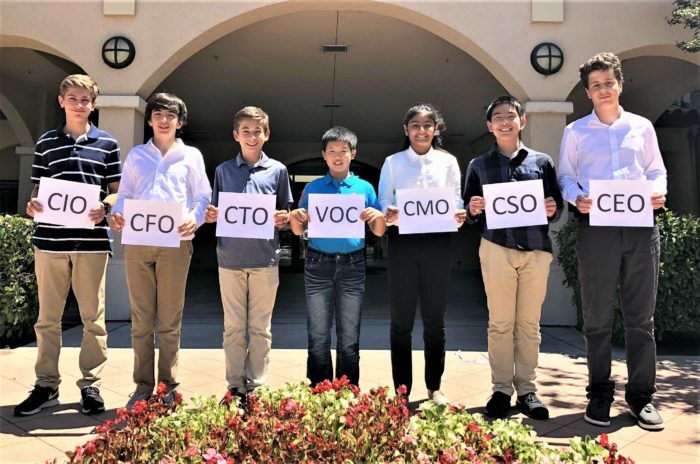 Congratulations to the seven members of the Savioke Team, Driven, with Product Innovation, NeverWait: Alejandro Antorcha, Arthi Abhyanker, Matthew Cao, Wilson Choi, Lucas Figueroa, Michael Rapp, and Jonathan Veis. These future entrepreneurs formed a team, negotiated their positions and decided to take on the Savioke product innovation business case while being mentored and coached with just in time hands-on learning of business and entrepreneurship skills. The team then brainstormed cool ideas and took on big challenges to create the “Never Wait” product design which they defended in competition at Microsoft to a panel of investors. The Driven team was inspired by Savioke’s original Relay Robot technology. They designed “NeverWait” robot, to efficiently navigate through dynamic environments and complete a variety of tasks in order to meet the Savioke business case requirements. The team created the NeverWait robot to be the first fully autonomous waiter robot, to significantly increase restaurant efficiency and customer satisfaction. Utilizing state of the art motion sensors and omnidirectional wheels, NeverWait’s agile movement and perception can compete with the best waiters.